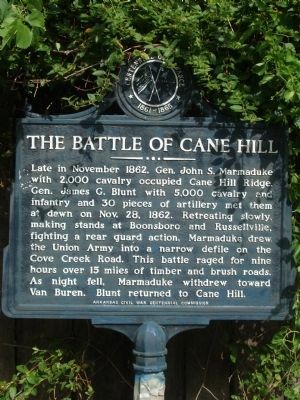 Late in November 1862, Gen. John S. Marmaduke with 2,000 cavalry occupied Cane Hill Ridge. Gen. James G. Blunt with 5,000 cavalry and infantry and 30 pieces of artillery met them at dawn Nov. 28, 1862. Retreating slowly, making stands at Boonsboro and Russellville, fighting a rear guard action, Marmaduke drew the Union Army into a narrow defile on the Cove Creek Road. This battle raged for nine hours over 15 miles of timber and brush roads. As night fell, Marmaduke withdrew toward Van Buren. Blunt returned to Cane Hill. Erected by Arkansas Civil War Centennial Commision. Marker series. This marker is included in the Arkansas Civil War Sesquicentennial Commission marker series. Location. 35° 54.533′ N, 94° 23.787′ W. Marker is near Cane Hill, Arkansas, in Washington County. Marker is on State Highway 45 just north of Patterson Road. Touch for map. Marker is in this post office area: Canehill AR 72717, United States of America. Touch for directions. Other nearby markers. At least 8 other markers are within 7 miles of this marker, measured as the crow flies. Washington County Cane Hill College (about 800 feet away, measured in a direct line); Cumberland Presbyterian Church (approx. 6.4 miles away); West Battlefield Overlook (approx. 7 miles away); Hindman Hall Museum (approx. 7 miles away); General Shaver's Headquarters (approx. 7.1 miles away); Battlefield Park (approx. 7.1 miles away); Battle of Prairie Grove (approx. 7.1 miles away); March of the Armies (approx. 7.1 miles away). More. Search the internet for The Battle of Cane Hill. Credits. This page was last revised on March 7, 2019. This page originally submitted on July 13, 2013, by Robert Macoubrie of Lenexa, Kansas. This page has been viewed 592 times since then and 21 times this year. Photo 1. submitted on July 13, 2013, by Robert Macoubrie of Lenexa, Kansas. • Bill Pfingsten was the editor who published this page. Editor’s want-list for this marker. A photo of the marker and the surrounding area in context. • Can you help?